Welcome to all Virginia members and clubs! I am eager to serve the VA Chess Federation (VCF) for a fifth term, having first been elected to the position at the 2013 VCF Annual Meeting and the VCF board in 2011. I am humbled by the continued support of the membership in having me serve the chess community in our great state of Virginia. The Old Dominion has had a long and rich chess tradition and my aim is to ensure that continues well into the future. Looking over this past year, our highlights include the successful hosting of the US Open chess tournament in the Mid-Atlantic for the first time in 20 years, a re-write and updating of the VCF By-Laws, adding a new VCF Officer position and prioritizing charitable solicitations to VCF (see the VCF website for a link for making charitable donations to VCF). The VCF ByLaws had last been re-drafted over 25 years ago and were in considerable need of updating and editing. Changes included installing a more vertical hierarchy of board positions, increasing the cost of VCF memberships (not done in decades), and most importantly, an update of the VCF non-profit status and the conflicts of interest policy for board members. We added the position of Women's Chess Coordinator, filled by Christina Schweiss (Hampton Roads), and found a replacement for our Membership Secretary, filled by Georgina Chin (Herndon). The new ByLaws take effect January 1, 2018. The US Open was held in Norfolk, VA this year (late July) and was a great success. USCF was very pleased with the Norfolk area and hopes to sponsor events there again in the near future. Regarding the Delegates Meeting, there is a new rule of note: pawn promotion is to be considered complete when the pawn touches the promoting square (to disallow using the board as a visual aid). And there are new measures to accommodate disabled players. See the USCF website for more details on both changes and more from the Delegates Meeting. 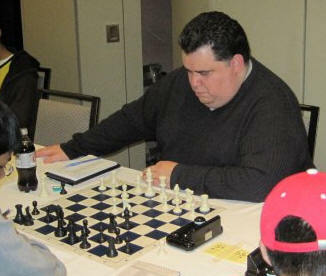 Looking forward, my focus and that of the VCF board will be to strengthen participation in our VCF-sponsored chess tournaments, including: the Emporia Open (Oct), the Zofchack Memorial (Nov), the Northern VA Open (Nov), the VA Open (Mar), the VA Scholastic & College Championships (Mar), the VA Senior Open (Jun), the Charlottesville Open (Jul) and the VA Closed (Labor Day). We will also prioritize board and officer accountability to the membership through increased transparency and accessibility. And we aim to modernize the VCF website. I also want to extend my thanks to Mike Hoffpauir as he leaves VCF to focus on serving on the Board of the US Chess Federation. While he will continue to serve as VCF Treasurer, we will miss his boundless energy driving numerous projects for our board. Mike has been replaced on the board by Akshay Indusekar who we welcome as an active Northern VA player who is initially interested in boosting veterans' participation in chess. I know Akshay from upstate events and expect he will bring a lot of energy to his new duties with VCF. Finally, for those who do not know much about me, this is my fifth term as VCF President. I am a Class A player from northern Virginia (Fairfax Station) and former Virginia Amateur State Champion (2011). I have been President of the Arlington Chess Club since 2010 having helped ACC President Emeritus John Campbell revitalize the club in recent years. We have breathed new life into club tournaments, simuls, GM lectures, and more, as players have returned to ACC. We also rebuilt the club's website and monthly newsletter. Lastly, I am a long-time member of the Morphy's Mojos chess team and Captain of the Arlington Fury (both of the DC Chess League). Please reach out to me and the other members of the VCF leadership with new ideas, to add your clubs to our webpage, to promote your events, and for help on any chess priority. Thanks again for your interest in and support of chess in Virginia!